The Australian researchers asked participants about their attitudes toward cyclists — and 31 percent rated cyclists as less than human. The dehumanization was even worse among non-cyclists: 49 percent viewed people who ride a bike as non-human, according to the study published in the journal Transportation Research. Delbosc and her team used standard psychological tests of the notion of dehumanization — that is when one group views another group as simply less human than themselves. Such tests have been used previously to show dehumanizing attitudes by one group towards others, for example. The study also connected the dehumanization to actual aggressive behavior toward cyclists — which was measured by asking respondents if they had ever driven close to a cyclist on purpose, or behaved aggressively in another way. The more dehumanization that a person admitted to, the more likely that that person behaved aggressively towards a person on a bike, the study found. “Respondents who rated cyclists as 89 percent human or less showed 1.87 times more direct aggressive behaviors to cyclists compared to the respondents who rated cyclist as more than 90 percent human,” the research team wrote. Dehumanization studies have measured negative attitudes toward racial minorities, women and other marginalized group, but this is the first study to apply it to people who ride bikes. Some of the negative, dehumanizing attitudes toward cyclists were similar to the animosity experienced by some racial groups, the study found. The average rating for cyclists was 82 out of 100, with 100 being fully human. To put it in perspective, “this rating is lower (i.e. more dehumanizing) than Americans rating Europeans, Japanese, Australians, Mexican immigrants and East Asians, but higher than Americans rating Arabs and Muslims, British people rating blacks and Muslims or Hungarians rating Jews, Muslims and Roma,” the research team wrote. To put it in even more perspective, researchers asked respondents to put cyclists on the chart below. 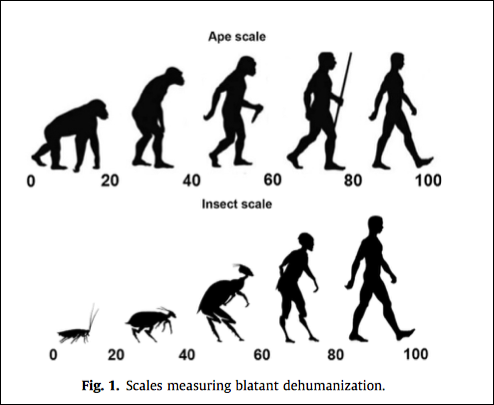 The “ape scale” is a classic “ascent of man” graphic used extensively in prior research. But enough respondents used bug slurs such as “cockroaches” or “mosquitos” to describe cyclists that researchers offered a second scale — the “insect scale” above. Aggressive behavior toward cyclists is fairly widespread, previous research has shown. About 70 percent of cyclists have experienced some sort of harassment from motorists, some research has shown. One study found 15 percent report having had an object thrown at them. “Public references to violence against cyclists are not uncommon and rarely given the same condemnation as, for example, violence toward women or bullying,” wrote Delbosc. One word of caution about the findings: the survey was not based on a random sample, so it is hard to generalize the findings to the broader population. The survey, for example, over-sampled high-income males, so it may be overstating or understating dehumanizing attitudes toward cyclists. The research team did not make specific recommendations about how to improve public attitudes toward cyclists. But they did speculate that Australia’s mandatory helmet law may contribute to the problem by obscuring riders heads and faces. Riding “uniforms,” kits and Spandex, may further contribute to the “othering” of cyclists. That is a fair point, each person’s experience is likely to be different. My experiences in life do not include living in a deep downtown major metroplex. I visit them with some frequency, but under no circumstances would I adopt that lifestyle – it does not suit me or my wife. We like modest sized towns, preferably college towns full of interesting and well educated people. But my life experience and 50+ years of study of the issues lead me to believe my views on how people interact on the roads are more representative of the majority than many who debate me in venues like streetsblog. I know how people actually behave, some badly, but most very respectfully of fellow road users. No one cares about your life story. Your personal feeling do not discount scientific research. Lose what? You’ve already proven me right 5 times in a row without me even trying. Thanks for Exhibit E, and by all means keep digging yourself deeper! Obviously you don’t understand that there is a huge blind spot on the right side of a heavy truck that obstructs the entire side view forward of the back drive axle on an 18-wheel truck, and from there backwards all the driver can see is a narrow triangle so that at the back of a 53-foot trailer the driver can only see 6 feet in width If you are right next to the cab on its right side in 90% of heavy trucks the driver can’t see you there. Bike boxes should be illegal and cyclists should have to wait in line like everyone else. We already had something similar back in the 1970s, and all it did was create a shift to cars that got better fuel mileage. Where do you think we will get the money to build massive amounts of public transit infrastructure as well as redesign cities and their suburbs in pre-1920s linear development fashion that works best with mass transit, and then operate most of our new public transit at a loss, when we can’t even afford to fix potholes today? Might have to move there for socialized medicine but I would most likely still elect to own a car there anyway . Just use your right turn signal, and we will move to your left side. In other words sharing your intent with the 3,000 lb vehicle is all that is needed. Generally I just take the full lane so this can’t happen. James, I think you’re missing a piece of the discussion. That part where I mentioned that the turn signal is on and I’m already starting the turn, and yet the bicyclists still try ride around the front right of the 30,000 pound vehicle. The solution I’m looking for is not some easy internet comment. It might require some deep thinking by those who want to be involved in trying to help make bicycling safer, or maybe just help bicyclists be more safe around someone who is pretty much doing everything he can to be part of SAFETY. Some people steal, some people do not know how to ride safe. Your doing what you can, hopefully some cyclists will learn how to ride safe as well from our conversation and my comment, which is the only answer. I would never be in the situation you mentioned, but I have seen plenty of people who do put themselves there. Education is the best we can hope for. I used to drive to work, years ago, and completely disagree. I was constantly blown away by how poorly drivers treat each-other. It put me in a bad mood often. Biking has changed that, especially an ebike, now I just take the lane, don’t share, they will take a mile. Honestly now, I just feel sorry for them now. I not only do I get where I am going, but I can converse with others on the way at stops, grab a bite, be apart of the world and stay in shape, never needing to hit a gym, while I eating as I please, due to the increased exercise. Unfortunately cyclists have hit gold, if no one else notices and wants to hate, oh well. What law in particular, that they break, do you find the most annoying, just curious? As a cyclist myself, I understand your perspective, but do you understand ours? Safety in Bike-Share: Why Do Public Bikes Reduce Risk for All Cyclists?